I step off the elevator onto the fifth floor of the library, hot coffee and security fob in hand. It’s June and quiet on campus, students and faculty retreating to other pursuits now that classes have ended. I don’t expect to see anyone on the fifth floor, especially students, so I’m surprised when I see Sheldon Scow sitting at a computer by the window, lost in his work, enjoying the quiet of the fifth floor almost as much me. He looks up, hearing me through his earphones, and gives me a bear hug. I try not to spill my coffee all over him. Sheldon is planning and leading summer camps for Indigenous youth on the Nanaimo campus this summer. He opens his laptop and shows me his plans. The camps look amazing, with everything from yoga to financial planning. I wonder if these young campers realize how lucky they are to have Sheldon at the helm. A year ago, I barely knew Sheldon. I had seen him in one learning circle where he had remained a little quiet, listening to VIU Elder, Uncle Gary Mason, and Aboriginal Projects Coordinator, Sylvia Scow, his mom, lead the discussion. But over the past year, I’ve had the privilege of working with Sheldon on a number of initiatives, getting to know him a little more, and becoming more impressed by his, and fellow student Aaron Moore’s, leadership in supporting faculty in understanding Indigenous teaching and learning from a student perspective. Last fall, Marilyn Funk and I asked Sheldon and Aaron to present with us in Vancouver at the BC Campus Symposium. Our session, profiling VIU’s Indigenous Learning Circles, was packed. We had to keep making the circle bigger to accommodate participants. Once our session started, Marilyn and I welcomed everyone and gave some context. But it was Sheldon and Aaron who shined that day. 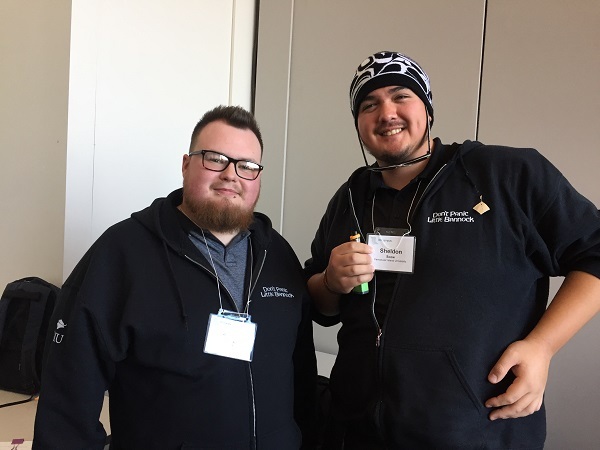 Their confidence in speaking in front of a large group of post-secondary instructors and administrators was humbling, and the participants hung on their every word, their stories rich and relevant to a room full of participants pondering “indigenization” in higher education. Aaron and Sheldon have different speaking styles. Aaron is soft-spoken, remarkably articulate for such a young person. The stories that he shares are honest and authentic. He seems to honour all questions by responding in a way that conveys appreciation, grace and patience. He is a likeable speaker, inviting everyone into his stories as if it were just you and him sharing a drink at a coffee house. Sheldon usually begins in his own language, a powerful way to introduce himself, situating himself in place and people. He is passionate and shares that passion generously with participants. He moves people with his stories; you can see it in the way they react with their laughter, and at times, their tears. I noticed how the room reacted to these students, and felt grateful and honoured that they were able to come with us. I wanted our participants to be inspired by what we had created at VIU, and to consider the ways they might engage similarly moving forward. But it was Sheldon and Aaron who were inspiring. I was reminded of the power of the student voice, and how it is often absent from our scholarly get-togethers, and our work in general. I began considering other ways that we can continue to intentionally include the student voice at our tables. What does Indigenous Perspective mean to our institution? Especially now as it sits as one of VIU’s 21 graduate attributes? Many are wondering. But there is not one answer. Perhaps we can agree that it’s not a perspective; it is a variety of perspectives, born from connections we create when we come together, when we share and when we make the time to meet, to discuss, and to listen to our Elders, to one another, and to students like Sheldon and Aaron. I am grateful for the conversations I’ve been part of, and am aware of how they’ve shaped me and my understandings. But more than the conversations, it’s the people I’ve met and the relationships I’ve made that have influenced me the most. Students like Aaron and Sheldon are shaping, in powerful, relational and authentic ways, VIU’s understandings and its culture because of their commitment to this work. At the end of our presentation in Vancouver, many participants thanked us, but many more told us how lucky we were to have these opportunities. I agreed. And added how lucky we were to have students like Sheldon and Aaron working alongside us, guiding us and moving us toward some new, better place. A place that we can’t get to without them.